"In search of a future that may not exist and faced with the decision of who to share it with, Cassia journeys to the Outer Provinces in pursuit of Ky - taken by the Society to his certain death - only to find that he has escaped, leaving a series of clues in his wake. Wow. 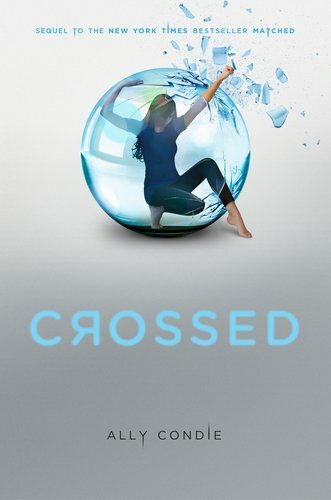 You never know how a sequel is going to turn out but I felt that Crossed was an excellent second book to Matched. Ally Condie wasted no time getting to the meat of the story which I loved. I didn't feel like there was any slow parts in the book at all. It was fast paced and was easy to get sucked into. One thing that did bother me is that sometimes I couldn't tell the difference between when KY was narrating and when Cassia was. I would have to double check the chapter title to make sure. It wasn't like that all the time, for the most part you could tell the difference. I loved the new characters that were introduced and felt the loss when they would leave the story. There was not much of Xander in this book but he was not gone and forgotten. He showed up in their memories and thoughts. You could tell he is still an important part of the story. Cassia seemed to be coming out of her protective shell more and seemed to have more strength and determination then the first book. The other characters had their quirks but there was reasons behind the way they were. I actually started to like Ky in this book more than I did the first but I found myself still cheering for Xander towards the end. Both boys have their secrets. I don't know who Cassia will choose once they unravel. There are still many unanswered questions about the Society and The Rising. You kind of get the sense that there might be similarities between the two. We seem to be learning about each thing at the same pace as Cassia is. Which makes sense for the story. I really enjoyed the book and would have given it 5 stars except for the fact that I sometimes got confused between Cassia and Ky voices. Definitely a 4.75 though! !